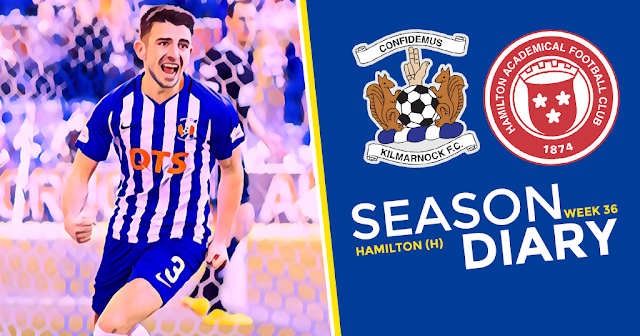 A five star performance with five unanswered goals from five different players…this is how it feels to be Killie! While Hamilton were not the same side who recently beat Aberdeen and Hearts, the score line actually flattered them as we could have hit double figures on the day. That said, the QTS Man of the Match sponsors must have over indulged in the hospitality to award their accolade to Youssef Mulumbu. While the on-loan midfielder was back to his ‘ball-sticking-to-his-feet’ best, Rory Mackenzie totally bossed the whole game and it was a travesty he did not get on the score sheet. The worrying thing for our opponents must be that two of our best players, Alan Power (3 more years...brilliant!) and Chris Burke, didn’t even start the game. Rugby Park’s own Benjamin Button did get a cameo, and a goal, but there is no denying the Steve Clarke got his players and his tactics right on the day…at times it looked like Greg ‘goal-machine’ Taylor was on another planet! Hibs are a different prospect though, and no doubt the boss will switch things up to suit. All we can do is travel in numbers and get behind the team who, sitting in third place with only seven games to play, are well worthy of the support. It’s great to see the crowds up 10% on last year but we have to keep trying to bring more people along to watch the magnificent football that is on offer at Rugby Park. The Club is undergoing major reconstruction on and off the park and getting a few more bodies into the ground as a result would be a real vindication for the time and effort put in by everyone at the Club and would hopefully encourage more investment in Killie. The Player of the Year Dance is at the Park Hotel next week, a bit early as always in my own opinion but I understand they want to have it while players are still here…check with SLO allenkyle@kilmarnockfc.co.uk for any remaining tickets.